This item is not available for purchase from this store. Click here to go to Amazon to see other purchasing options. This is the one and only, or rather the ultimate DVD from the metal gods themselves! It was recorded at the legendary Brixton Academy show in London in December 2001. The live show track listing features quite a few songs that haven't been played live for quite a while including Turbo Lover and Desert Plains. On top of that, the DVD features tons of behind-the-scenes material, rare footage, interviews, soundcheck footage, and lots more! 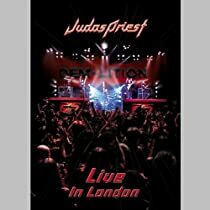 This DVD was recorded live on 19th December 2001 at the Brixton Academy, London--an exclusive live performance by the heavy metal legends--rare concert footage of this show featuring an extended set of many Priest classics as well as material from their latest album Demolition. Also, rare backstage footage, the band during sound check, being interviewed and traveling the world--thsi package is a must for every Priest and metal fan on the planet! Can't wait to get my hands on this DVD, a long overdue release from the Metal Gods. Since there's hardly any info listed here, I searched for the Track Listing on the distributors website. I wish they had included "Beyond the Realms of Death" , but I guess I'll have to take what I can get. According to them "the DVD features tons of behind-the-scenes material, rare footage, interviews, soundcheck footage and lots more!" This concert was recorded at Brixton Academy in London, December 2001. I'm anxious to hear the power of Priest blasting through my Surround Sound System! This is a good DVD that shows Priest can still rock after all these years. If you are a long time Priest fan like me you cannot help but compare it to the old stuff. I saw Priest live in their prime on the Defenders tour 19 years ago, then again on the Turbo tour and I saw a videotape made of a concert on the Screaming for Vengeance tour. So with that bias I have a hard time giving this one 5 stars but there are also some objective criteria that justify removing one star. But first the positives. - The highlight of the DVD for me is Painkiller. You can tell the whole band is totally into it and just kicking rear. If there weren't any close-ups of Glenn and KK you would swear these guys were twenty-year-olds. - The heaviness of Victim of Changes really comes through when played live. The technology of the original 1976 recording does not allow this tune reach its full potential, although it is an all-timer in any format. - They slow the pace on an acoustic version of Diamonds and Rust to great effect. - Adding Desert Plains to the set list. This has always been one of my favorite Priest tunes but rarely gets the attention it deserves. - Ripper's singing is just great. Worries about Halford should be put to rest (but I do support at least one reunion tour before they call it quits). - The way Glenn rips into the main riff of Hell Bent for Leather after sustaining some guitar feedback subsequent to the main intro chord progression. - Jugulator and Demolition tunes come across better live than they do on studio recordings. - There are a few instances where the band does not seem to be totally into the gig. By this I do not mean they look bored. Rather, there are exaggerated attempts at poses and facial expressions, especially by Glenn, that seem forced and unconvincing. This happens toward the beginning so maybe they just needed time to get into it fully. - Shots of the crowd try to create the illusion that there is complete mayhem and frenzy among the fans. They do this by editing in real quick tightly focused shots and some clips of security pulling people out of the supposed throng at the front. I don't buy it. What I see is a casual crowd simply bobbing their heads to a good show. - Not one track from Defenders of the Faith on the set list (Half Sentinel at soundcheck does not count)! There's no justification for that. - The soundcheck segment. Who cares about soundcheck? Add in more tunes to the actual show! Why Desert Plains, Running Wild and the rest twice (soundcheck and show)? How about Freewheel Burning instead? - You've Got Another Thing Coming taken out but Breakin the Law AND Living After Midnight left in. Whatever. - Interview/candid segments somewhat scanty and short on substance for a band that has been on the scene for more than 25 years. Overall a good show that builds in intensity as it moves along. Sound quality is great. Picture quality is fantastic. Set list good. A worthy addition to any Priest collection. Much better than what I expected! I expected a good quality concert, but this DVD has more than that. Video is great, music is great, and the setlist is great. You have songs that are not from the regular repertoire like United, Turbo Lover, and Desert Plains. The concert is excellent (19 songs live), plus you get another set of songs without the audience. Desert Plains, Running Wild, Turbo Lover, The Sentinel, Machine Man, and Lost and Found. I hope Halford makes his own concert DVD and include old tracks like Dream Deceiver ,Dissident Agressor, and Steeler.